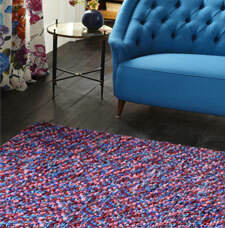 Beans rugs are a funky collection of multi-coloured wool rugs. The rugs are made of pure new wool and feature a visually dazzling dotted pattern. Each rug is made up of chunks of wool that are stitched together and then woven onto a cotton backing for extra stability. Beans is a truly stunning and stylish collection of rugs.